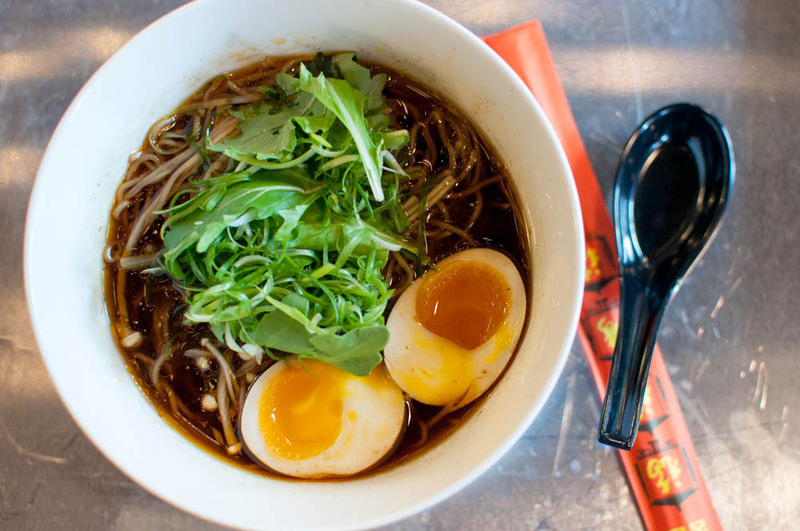 When did Midtown West become such a hot destination for ramen? It seems as if all the hip and trendy ramen shops collectively decided overnight that they had to stake their spots in the neighborhood and in the blink of an eye, we found ourselves surrounded by Ippudo West, two Totto Ramens and the newest kid to the block, Ivan Ramen Slurp Shop. 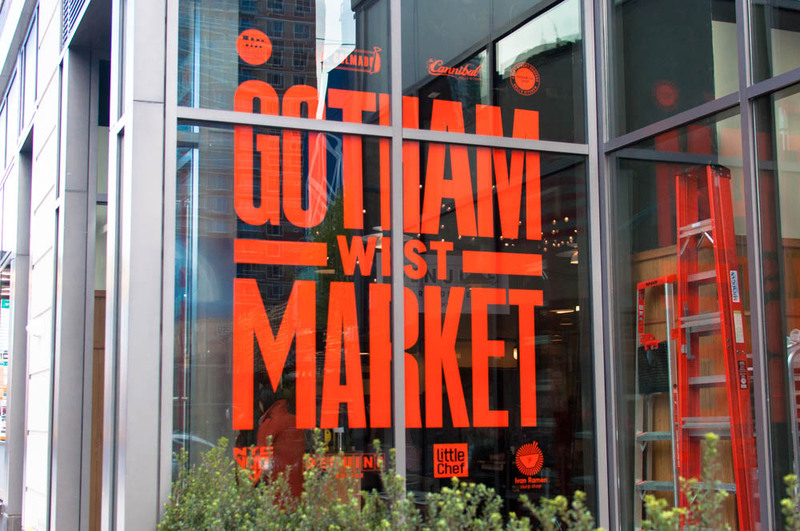 Ivan Ramen Slurp Shop is the first New York outpost for Ivan Orkin and is located in the spanking newly opened Gotham West Market. 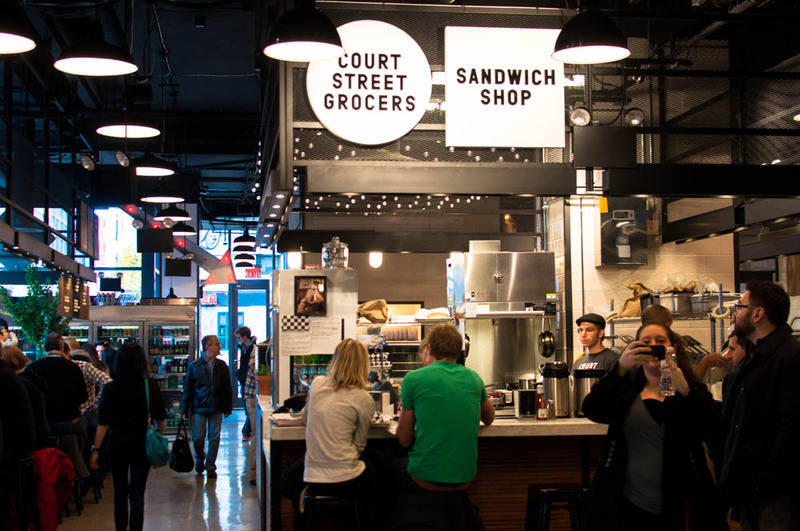 The market isn’t really a market but more of an upscale food court featuring some pretty awesome vendors like Blue Bottle and Cannibal. 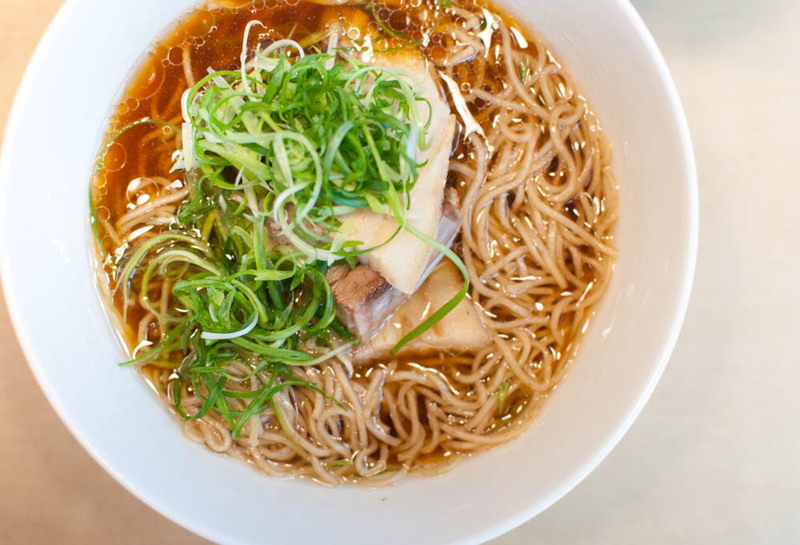 But you will notice right away that the crowds are drawn to Ivan Ramen Slurp Shop first and foremost. The noodle spot is set up as a long counter with a number of bar seats where you can sit and watch the chefs sling bowl after bowl of noodles. No table service at the casual food court so this means that you can pretty much carry your bowl of delicious ramen to enjoy anywhere you can find a seat. The menu here is tightly edited, featuring five ramens and three donburi bowls with two sides. All the ramens here are made with Ivan’s signature toasted rye noodles, a thinner yet more robust and flavorful version of the noodles that we have come to associate with ramen. From the ramen side of the menu, there are two classic ramens, a shio and a shoyu, both made with a light broth duo of chicken and dashi and served simply with delicious pork chashu. For those looking for something a little different, the roasted garlic mazemen is the perfect way to go. Instead of the typical bowl of broth, the same rye noodles are immersed in a thick and intensely garlicky almost sauce like broth. Just in case you didn’t realize that this will be one of the most flavorful garlic noodles you have ever had, they rest a single clove of roasted garlic on top of a thinly shredded pile of scallions as a reminder. A word of warning though, remember to bring a tooth brush or a pack of strong mint with you or you will find yourself constantly checking your breath throughout the day. The remaining two ramens on the menu are for the vegetarians among us. 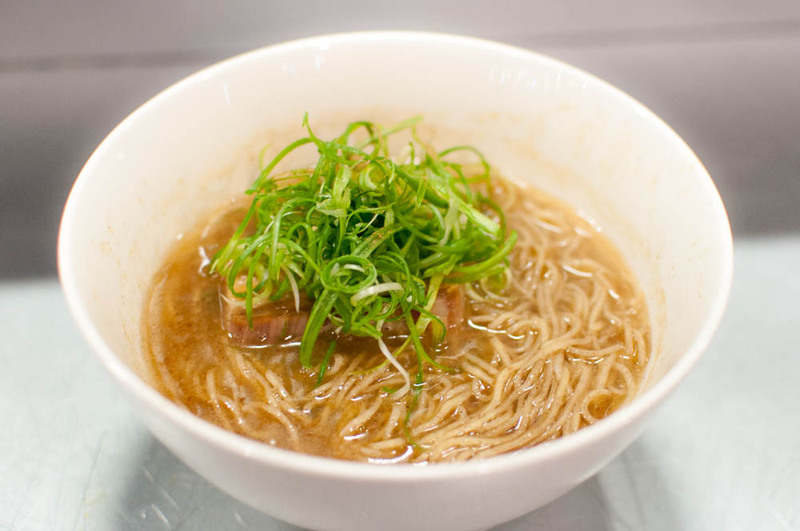 The first is a basic shoyu vegetarian broth ramen served with enoki mushrooms and a handful of greens. While I appreciate simplicity, I couldn’t help finding myself missing the complexity of the vegetarian ramen at Totto just a few blocks east. The chili eggplant mazemen will make a much more exciting choice for vegetarians and will even satisfy the carnivore in you. Like the roasted garlic mazemen, the vegetable and soy based broth is made thick here with the addition of soft meaty eggplant. Finished off with a generous ladle of smoked chili oil, this is definitely not light but each bite is exciting and flavorful. Moving onto the rice half of the menu, you will find yourself at a cross roads. You see, all three of the rice bowls are quite enticing. 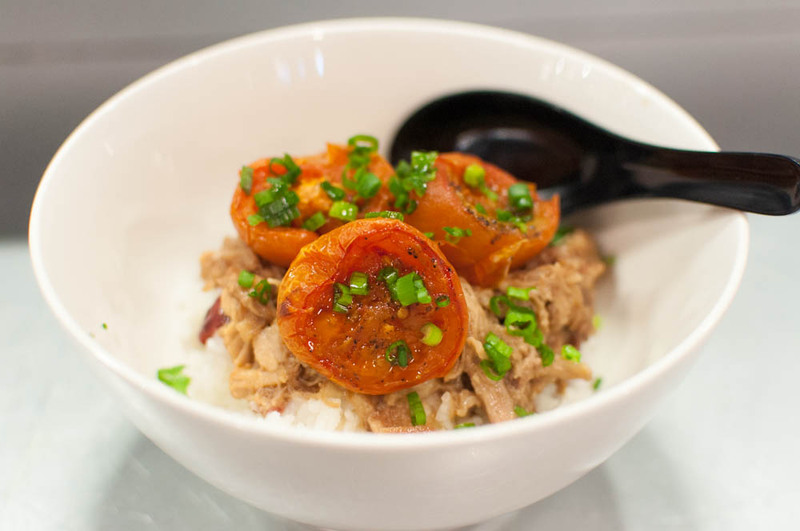 The first is a deliciously filling bowl of slow-cooked pork donburi served with roasted tomatoes, scallions and an addicting salted plum wasabi. The pork is fatty and perfectly seasoned. The salted plum wasabi, an unexpected yet welcoming ingredient, breaks up the richness of the pork. You will not be able to stop after that first perfectly balanced bite of pork, wasabi and rice. The second donburi pays homage to New York. 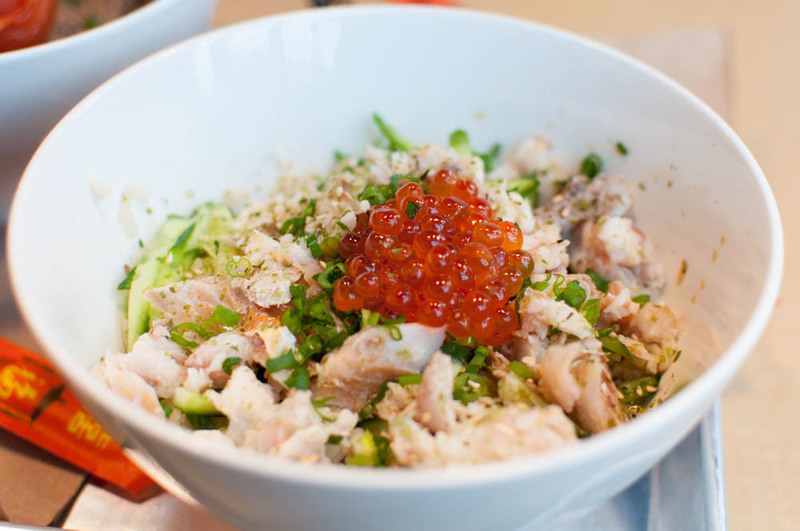 Featuring shredded smoked white fish, the white fish donburi is topped off with a generous scoop of salmon roe. The salty fish is balanced by the sweetness of the soy and rice and the roe surprisingly doesn’t overpower the flavors at all. 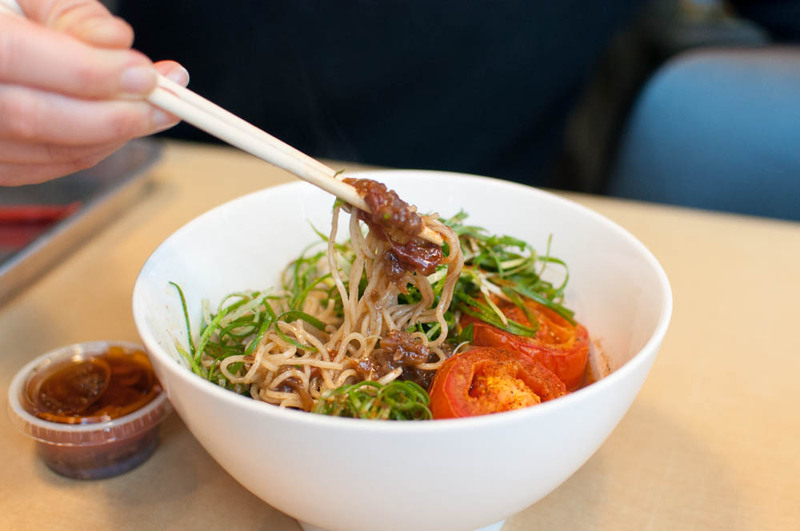 This lighter rice bowl is definitely the yang to the ying of the rich slow-cooked pork bowl. And rounding up the rice bowls is a plate of curry rice made with shaved rib eye. 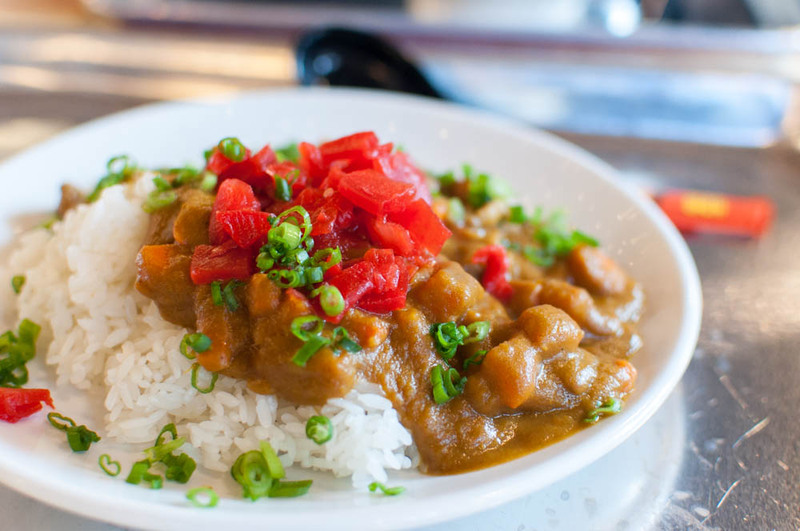 The sweet thick Japanese curry reminds me of home cooking and is brightened by the addition of pickled radish. Unfortunately, even the quality slices of beef couldn’t make the rice stand out on its own as a must try. Finally, the menu at Ivan Ramen Slurp Shop is rounded out by two sides, a sweet and spicy eggplant and a negi salad. The sweet and spicy eggplant is served chilled and not as spicy as I had hoped. 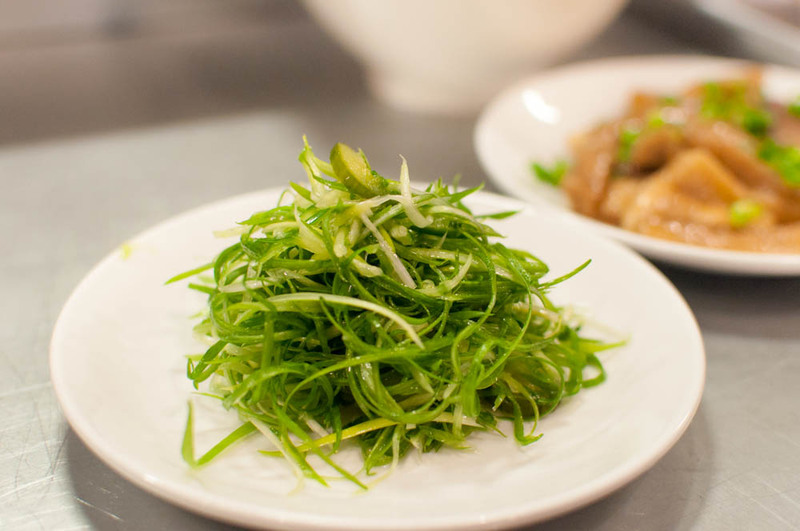 The negi salad is a tangle of thinly sliced scallions and pickled cucumbers tossed in a shiso vinaigrette. 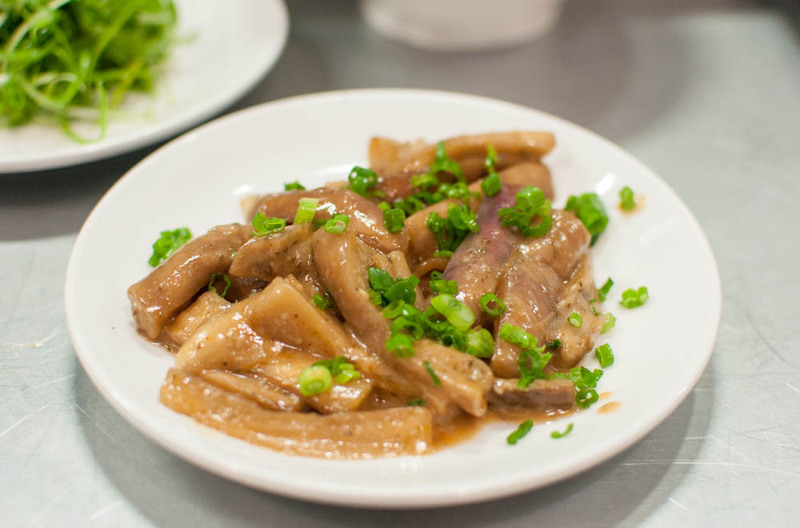 Unless you really enjoy the pungent taste of scallions on its own, I would recommend skipping this particular side dish and sticking with the eggplant instead. While Ivan Ramen Slurp Shop features a rather edited of what Ivan has been showcasing in his shops in Japan, I am glad to have it as part of the ramen gang in Midtown West and am looking forward to the opening of the bigger LES location in the near future. 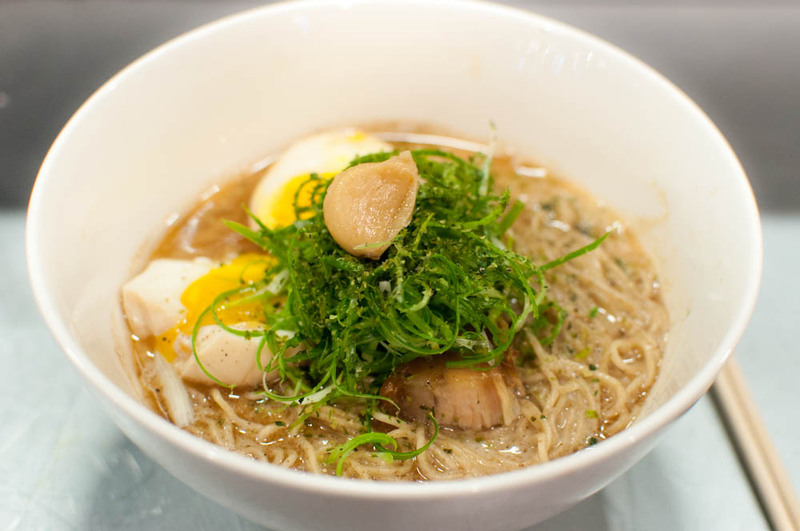 The ramen here has a distinct personality that differentiates it from its peers. 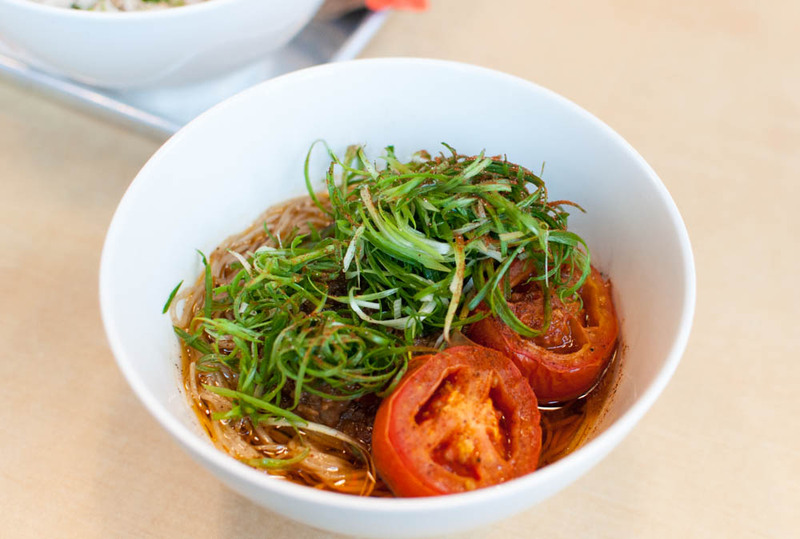 Which one you might favor really will depend on your preferences for broth and noodles. For me, the draw will definitely be the pungent and aromatic roasted garlic mazemen and the rich slow-cooked pork donburi. Both are delicious enough to draw me all the way to the edge of Manhattan on 11th avenue and 45th street for a bite.